Bestafe Casinos provide players with expert and helpful customer service 24 hours per day, 7 days per week. Players can contact a customer service representative instantly via live chat online or use the toll free phone number 0044-808-2800 766. Another avenue would be email support. Betsafe opened its doors in 2006 and is owned by Safepay Malta Ltd. It is licensed in Malta and regulated by the Lotteries and Gaming Authority. It has quickly become a favorite among players in many countries and first time visitors will find their website very user friendly and easy to maneuver through. Betsafe Casinos support the following languages: English, Polish, Finnish, Swedish, Norwegian, Danish, Bulgarian and Latvian. Currency supported at Betsafe Casinos is US Dollars, British Pounds and Euros. Betsafe Casinos do not accept United States players. Betsafe Casino has provided the ultimate in online gambling by offering players two casinos. The Betsafe Casino Red is powered by the unrivaled NetEntertainment software platform and the Betsafe Casino Black is using the elite Cryptologic software. Each casino offers players over 100 online games and their very unique slot games. The Betsafe Casino Red is played instantly on your browser, while the Betsafe Casino Black software can be downloaded or instant flash play. Betsafe Casino Red provides players with 70 unique video slot games and 11 classic slot games. This casino also offers players versions of roulette, blackjack, baccarat, table games such as Texas Hold’Em, Red Dog, Caribbean Poker and much more. Players can also enjoy video poker and other games such as bingo, keno and scratch cards. There is a game for everyone and their exclusive slot games have superb graphics and 3D animations and are very popular among players. Some of the most popular are Jack and the Beanstalk, Jack Hammer, Gonzo’s Quest, Bloodsuckers and Mega Fortune. Jack Hammer II is now available for players. 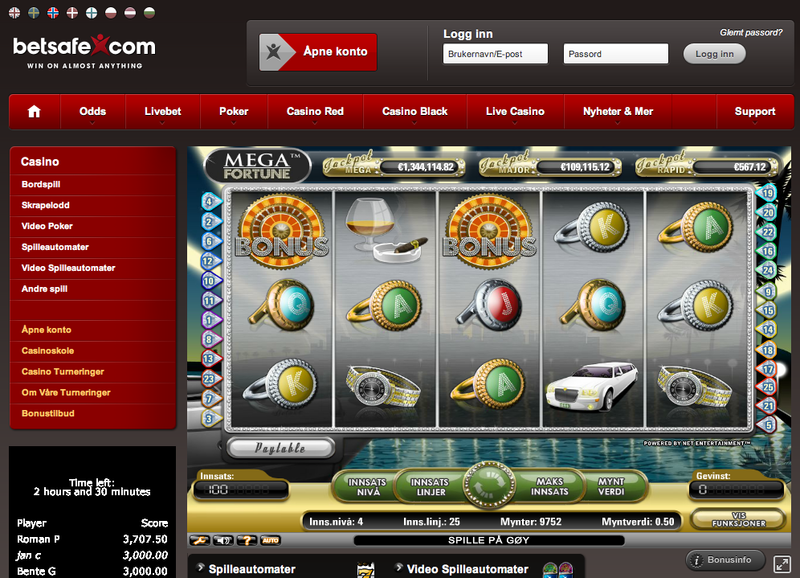 Betsafe Casino Red also provides players with 14 huge jackpot games and one lucky winner just won $3.9 million dollars on their Mega Fortune game in the Casino Red. Betsafe Casino Black also provides players with over 100 games, but being powered by Cryptologic software offers players the exclusive Marvel comic super heroes and villain slot games. Players will enjoy favorites such as Spiderman, Ironman, Green Lantern, Superman, Wolverine and much more. One of the most popular slot games of all time, Thunderstruck, is available at Betsafe Casino Black along with the new Thunderstruck II. Players will also find all their favorite online casino games at Betsafe Casino Black such as roulette, blackjack, baccarat, video poker, keno, bingo, scratch cards and specialty games. Betsafe Casino Black also offers players 21 enormous jackpot slot games worth millions. Betsafe Casino also provides a Live Casino where players can interact with live dealers while playing their favorite game of roulette, baccarat or blackjack. Betsafe Live Casino is powered by the popular Evolution Gaming software and players will feel like they are in a real live casino interacting with live dealers and fellow players. Betsafe Casino Red offers new players a 100% welcome bonus up to $100. New players just have to create an account, choose their deposit method and make a deposit. The minimum amount of the deposit is $10 to receive a 100% welcome bonus, but new players depositing $100 will receive $100 free. Players will then go to the tab “Available Bonuses” and choose the Casino Red bonus and their bonus will be applied immediately. There is no VIP loyalty points program when joining the Betsafe Casino Red. Betsafe Casino Black also offers new players a 100% welcome bonus up to $200. New players will follow the same procedure, however, the minimum deposit is $15 and a player can receive up to $200 free with a $200 deposit. Betsafe Casino Black does offer a Black Diamond VIP loyalty points program and for every 100 Black Diamond Points, a player will receive $1 casino credit. Players will start earning rewards as soon as they sign up and register an account. Promotions and bonuses are nonstop and continuous from special bonus offers to cash back rewards. Players also can participate in weekly tournament action for additional casino credits and exciting entertainment competing with other players. There is a wide variety of payment methods available for customers of Betsafe Casino. Both casinos offer players deposit methods through Visa, Visa Electron, Mastercard, Entropay, Neteller, Przelewy 24, SpeedCard, Maestro, Skrill (Moneybookers), Fundsend, ClickandBuy, Bank Transfer, and Citadel and Wire transfers. Withdrawal options include Visa, Instant Bank, ClickandBuy, Skrill (Moneybookers), Neteller and SpeedCard and Wire. The minimum withdrawal amount is $20 and Betsafe Casino is prompt with deposits and withdrawals. Security is a top priority at Betsafe Casinos. All transactions are secure and safe via the latest in SSL encryption technology. Betsafe Casinos also know the importance of fair play and customer approval. All games are subject to independent testing for randomness and fairness. Betsafe also has set up a system whereby players can control the amount they spend on gambling, even to the point of allowing the customer to set gaming limits or to set self-exclusion limits from gambling for 24 hours up to 6 months. Bestafe Casinos provide players with expert and helpful customer service 24 hours per day, 7 days per week. Players can contact a customer service representative instantly via live chat online or use the toll free phone number 0044-808-2800 766. Another avenue would be email support. For general inquires players would email support-en@betsafe.com or for deposit and withdrawal inquiries, customers should email payments-en@betsafe.com. Support staff for players is excellent and they can answer any question from how to set up your account, making a deposit or online games. Support staff prides themselves in prompt and courteous service and if your query is not answered within 15 minutes, players will receive $10 free. Players will also find that they can bet on live and future sports events and this site also has a Black Poker room and a Red Poker room for those enthusiasts. 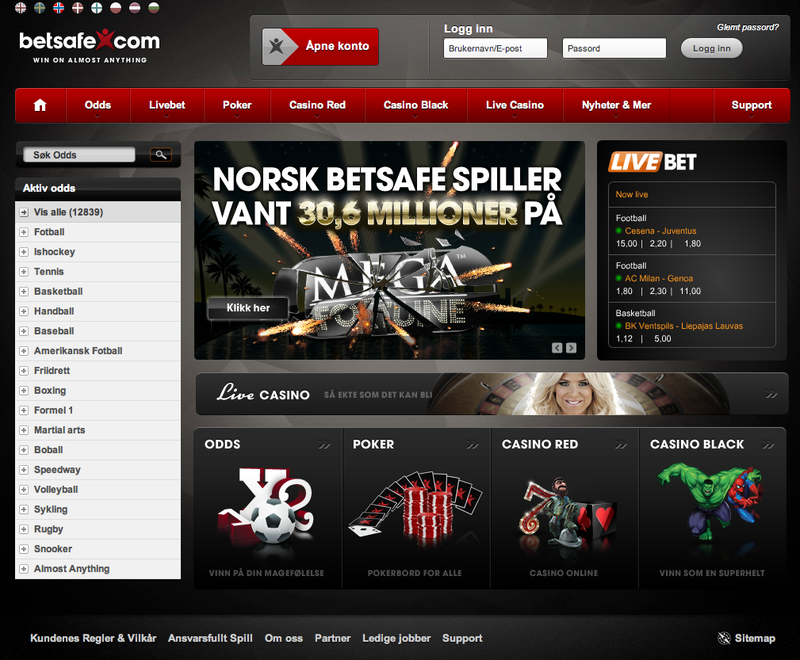 Betsafe Casinos offers a safe, secure and enjoyable online gaming experience. Players will find the best in bonuses, customer support and online games at Betsafe Casinos. Players on the go will also want to join Betsafe Mobile. Players can enjoy their favorite online casino games on their mobile devices; whether they are at the beach or at work and will never miss out on the action again.